JAZZED OUT SINGIN' ​& JITTERBUG DANCIN'! It's the 100th Birthday Celebration of Ella Fitzgerald and we are so excited to bring you The “Lady Ella” Show! This jazzed out event is a captivating tribute with big band swinging, jazzed out singing and jitterbug dancing that features the vocal styling of national recording artist, Nicci Canada. Her melodic, warm vocal presentation captures the essence of Ella and is sure to warm hearts and sooth the souls of those who revere her. Under the leadership of Saxophonist and Music Arranger, Letron Brantley, the big band sounds of the Dapper Street Jazz Orchestra deliver classical, compelling tunes from the Gershwin and Cole Porter library such as Summertime, Just Another Rhumba and S’wonderful; a telling reflection of Fitzgerald’s repertoire. 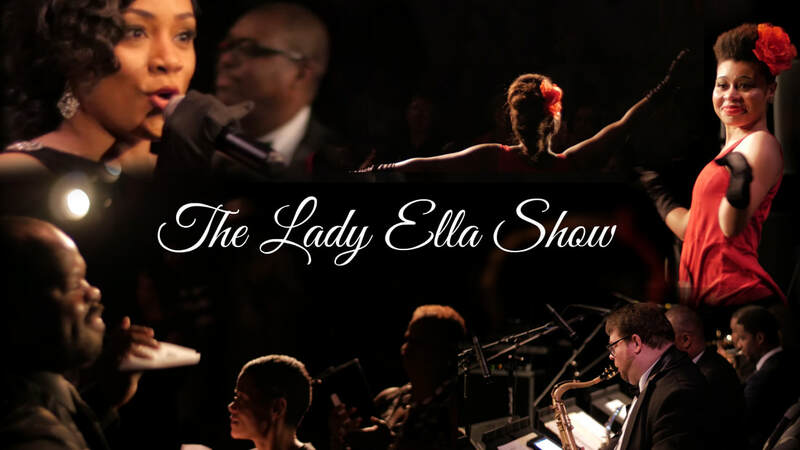 The Lady Ella Show is entertaining, it’s jazzical, it’s educational and exciting; telling the story of an iconic singer that will be memorable for years to come. We love you Ella! West Virginia native, national recording artist, Nicci Canada possesses a unique ability to connect with listeners, Nicci uses her voice as a canvas to showcase the truths of the heart and soul. Her warm, sultry vocals are reminiscent of artists such as Ella Fitzgerald, Billie Holiday and Nina Simone, but her amazing sound is unique to the gifts and talents she has been given. Nicci released her first solo project in 2011 title “Twenty Twelve”, an eclectic mix of melodies that highlighted her unique vocal ability and introduced her to audiences around the world. However, it would be the grace and soulful serenity of Jazz that called to her heart and would deliver her to a world of jazz enthusiasts. She has since gone on to perform with the Charleston Symphony Orchestra and the Tulsa Signature Symphony. Nicci is absolutely delighted and humbled to pay tribute to one of the greatest singers of all times. Letron "LTrain" Brantley is a native of South Carolina and has been an active performing jazz saxophonist since the age of 15. In his younger years he was heavily influenced by Jazz, Gospel, and R&B music and went on to study music at Winthrop University in Rock Hill, SC; allowing him to hone his craft as well as perform with various Jazz, Soul, and Funk groups. With major influences such as Sonny Rollins and John Coltrane and composers like Duke Ellington and Charles Mingus. Letron continues to be an in demand saxophonist and bassist and can be heard on several Jazz, Gospel, and R&B recording projects. He is an active music community supporter and clinician dedicated to the mission of embracing and encouraging musicians young and old to be persistent in their craft and always strive for excellence. As music director for Dapper Street Productions, Letron brings his musical influence to the stage that create arrangements that that give a new flavor while keeping the integrity of the music.